1st baby: You pre-wash newborn’s clothes, color-coordinate them, and fold them neatly in the baby’s little bureau. 2nd baby: When the pacifier falls on the floor, you squirt it off with some juice from the bottle. BUT one thing that I’ve always been pretty good about is making sure that the nursery is ready. With my first, it was painted and decorated, ready and waiting months in advance. With Emerson things were even easier to get ready. Since she was going to be sharing a room with her “big” brother(only 19 months old at the time), there wasn’t a whole lot we had to do other than move Tucker over to the “big bed”. Luckliy there was no “big bed” trauma like so many of my friends have experienced. 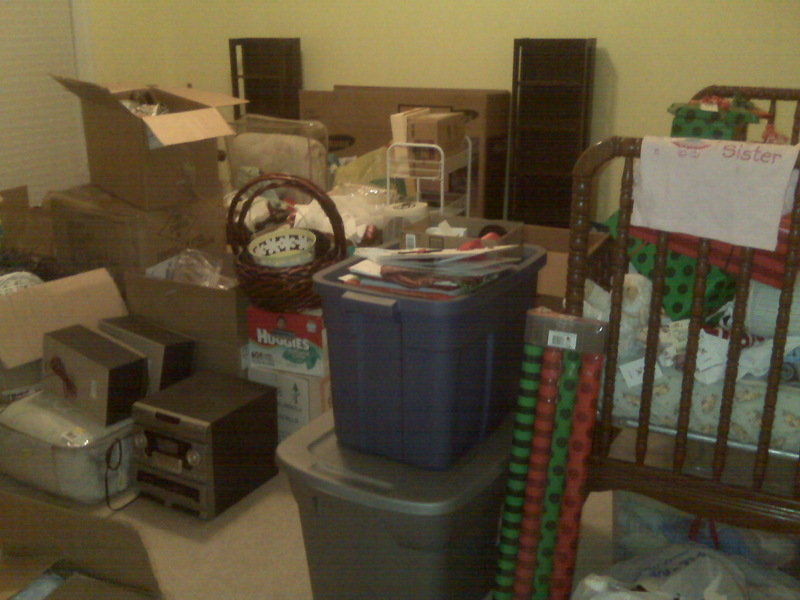 As you can see, the nursery is full of boxes. The crib is full of Christmas presents. There is no shower curtain in the bathroom. I’ve not hung a single picture or any drapes. I haven’t even bought drapes or wall decor! I do have an excuse or two, though: we have moved twice in a matter of months, I’ve been sicker longer and more often, my “big kids” are at a point where you can’t trust them alone for more than 10 minutes, I’m supposed to be “taking it a little easy” because of my blood pressure, and I’m just plain tired. Oh, well…#3A won’t know what boxes are, or even actually be able to see them very well. (S)he will need the crib cleaned out, but even if that doesn’t happen then (s)he can sleep in the car seat if need be for a night or two. I’m pretty sure that (s)he won’t be taking showers very soon, so the shower curtain shouldn’t be an issue either. I do however need to actually find the carseat. And it’d probably be a good idea to buy at least one pack of diapers. I don’t think Emmie’s size 5’s will be very useful. I haven’t bought any new clothes, but I should probably wash the few unisex things I have…they have, after all, been packed up for 2 years. I kind of can’t believe that I’m already a little over 34 weeks. Since I’ve never made it past 38 weeks, that means little #3A could be(and hopefully will be) here in less than a month. I really must look for that carseat tomorrow! You know I’ve got baby clothes for both genders. I’ll wash and bring you a few newborn things. Let tucker find the carseat. Tell him it’s a game and he gets chocolate at the end!